The middle-aged man reclining on the table in the Rinehart Clinic's procedure room appears healthy but for the neat track of stitches on his upper lip, the result of a surfing mishap. Dr. Harry Rinehart '68, peering closely, is pleased with what he sees. "That's looking better than I thought it would!" he says with a wide grin. In minutes, half the sutures are out; the rest will come out a few days later. Rinehart heads to an exam room down the hall, where a young man is waiting to talk with Doc—as he's universally known in these parts—about the treatment he's been getting for depression and ADHD. Before the day is out, Rinehart will troubleshoot a set of complex test results from a 93-year-old World War II veteran; treat a middle-aged woman plagued by cyclic vomiting syndrome; address a wisecracking, wheelchair-bound, 73-year-old diabetic's chronic pain; and provide an experimental and—so far—promising treatment to a physician from a nearby town whose depression has been so severe, she hasn't worked in nearly a year. He will end his day back in the procedure room, performing a vasectomy. And that's on his supposed "day off." A patient mix of this kind isn't unusual in a rural family practice. What is unusual is the lengths to which Harry Rinehart, a fourth-generation Oregon doctor, is willing to go to help patients, following the same spirit of innovation that characterized his parents' and grandfather's practice in this same clinic in the town of Wheeler (population 414), 20 miles south of Cannon Beach on the northern Oregon Coast. Logging in the Coast Range was in full swing when Harvey Earl Rinehart, MD, son of The Dalles physician Belle Cooper Rinehart Ferguson, MD, arrived in Wheeler in 1913, recruited by sawmill owner (and town namesake) C. H. Wheeler. Three decades later, Harvey's daughter-in-law Dorothy White Rinehart, MD, arrived and joined the Rinehart Clinic; her husband, Robert E. "Bob" Rinehart, MD, would follow after he was released from World War II service in North Africa. The clinic provided not only general medicine but also specialty care for arthritis, which drew patients from across the country. The younger Drs. Rinehart eventually divorced, and Bob Rinehart moved to Portland, but Dr. White, as she became known, stayed on, providing care, delivering hundreds of babies, and raising the couple's half-dozen children. 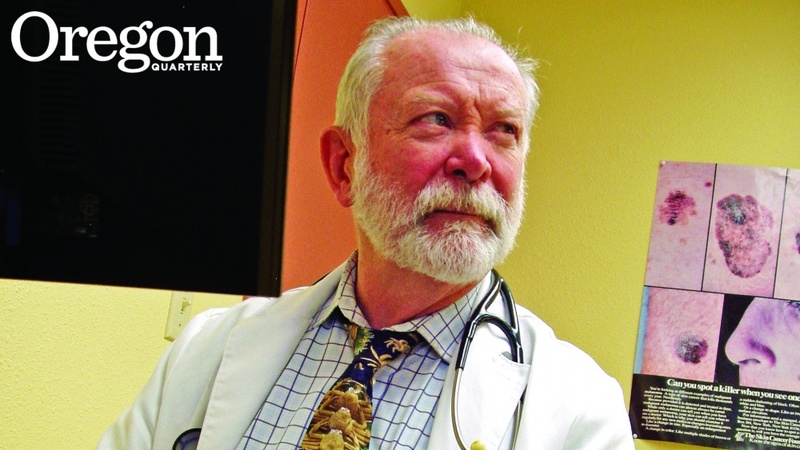 One of those six, Harry, attended medical school at OHSU and served a stint in the U.S. Army before practicing medicine in Prineville for 13 years. In 1990 he was recalled by the Army for five months of service during the Gulf War. Upon his return, he and his wife, Nancy, decided it was time for a change. While she pursued training as a surgical nurse, he worked at hospital emergency rooms in Astoria and Seaside. By the early 1990s, Dr. White had retired, and the last doctor had left Wheeler. Tillamook County General Hospital had taken over the Rinehart Clinic, staffing it with locum tenens—short-term visiting doctors—who saw a trickle of patients. "I'd always wanted to come back," Harry recalls. So he and Nancy stepped in to staff the clinic, and within two months they had tripled the number of patient visits. With the community's support, he put together a board of directors, and by the start of 1994 he was the medical director of what would ultimately become an independent, private, nonprofit, federally qualified community health center, allowing Rinehart to treat everyone in the community—people he had grown up with, and their children and parents—regardless of their ability to pay. Today, the Rinehart Clinic has three physicians plus a physician's assistant, psychiatric nurse practitioner, and social worker and hosts a parade of visiting specialists from Portland and Seaside as well as numerous students in training. Beyond possessing the administrative skills that salvaged a small town's only clinic, what most distinguishes Rinehart is his willingness to tackle tough diagnoses and offer innovative treatments if he thinks they might help a suffering neighbor. Chronic pain, for example, is a condition so difficult to treat and so fraught with risk—of turning patients into addicts, of patients scamming doctors for narcotics that they can abuse or turn around and sell on the street—that many physicians shy away entirely. Society of Oregon, in 2011. He also provides treatment for drug addiction using Suboxone, a safer, more convenient, and often more effective alternative to methadone, requiring patients to participate in support groups that he facilitates himself. "Sticking his neck out, every single day, doing the right thing," sums up Hahn. "He's an amazing person." Severe depression—the kind antidepressant medication can't fix—is another condition Rinehart has tackled head-on. Last year, he learned about the success some major medical centers around the country were having with experimental use of ketamine, an anesthetic, as an alternative to electroshock therapy. Rinehart studied the clinical literature and began offering the treatment to a small number of severely stricken patients. "He went ahead and used it off label, which is quite proper; he's simply an early adopter," explains Bill Wilson, MD, a professor of psychiatry at OHSU, where institutional protocols limit doctors' opportunities to try new treatments before they've been thoroughly vetted—constraints Rinehart doesn't have. Wilson has since referred a couple of his own suicidal patients to Rinehart, with good results. "It reminds me of the way medicine was practiced maybe 50 years ago," Wilson says, "when individual practitioners made decisions themselves based on their reading of science, and we weren't as constrained by all of the things that may lead us to be too cautious or to act as a coordinated group rather than as individual practitioners. And while much of that has been to the benefit of people, we've also lost something of the independence of physicians. Dr. Rinehart hasn't lost that independence. He does what he thinks is best and helps a lot of people in the process." Meanwhile, at age 67, Rinehart has begun to take tentative steps toward retirement, cutting back to a mere 60 hours per week and hiring an internal medicine physician to share the load. He and his wife even took an out-of-town vacation—their first since 1996. Still, he's in no hurry; his own mother worked into her late 80s. When he finally does retire, there will be no young Dr. Rinehart to continue the family business to a next generation. If he's disappointed that none of his four children (a businessman, an artist, an FBI agent, and a realtor-mom) chose a career in medicine, he doesn't show it. "They're great kids," he says with a proud smile. With his seven-days-a-week practice, Rinehart would be a hard act to follow in any case. He explains his dedication to his patients in simple terms: "I know that there are people who cannot get treatment other places."